Let’s face it – cleaning the kitchen is the hardest part of your daily life. Getting rid of the crumbs, dirt, stains, and splatters are, by no means, an easy task. Of all items, kitchen cabinets are typically the most challenging, considering there are upper, lower and corner cabinets in every kitchen. The door and drawer fronts are even harder when they have decorative details such as raised panel doors and decorative molding. If you want low maintenance kitchen cabinets, you can rank the suitability of various kitchen cabinet styles for how high or low maintenance they are. 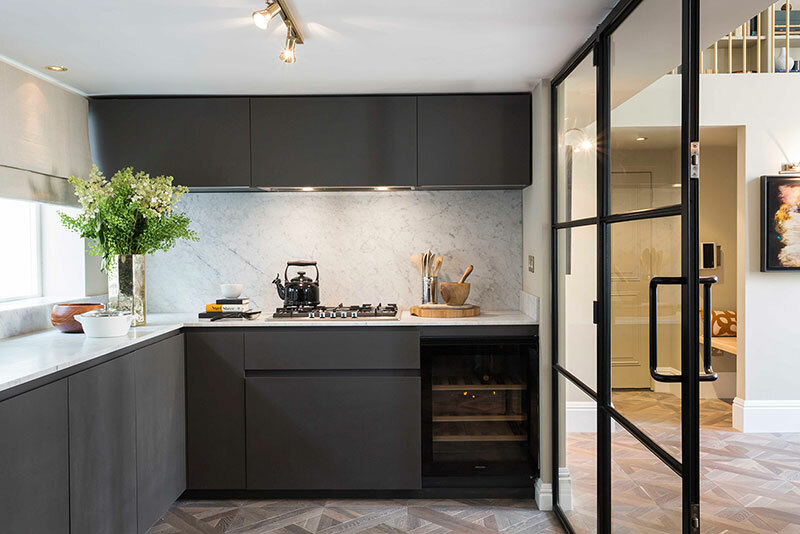 Of course, your kitchen cabinet choices will also take into account other factors such as your overall kitchen aesthetics and the costs associated with the different kitchen cabinet materials and styles. Here’s a short summary of different kitchen cabinet styles with particular emphasis on the maintenance aspect. With flat-paneled doors and rail frames along with natural wood finishes in neutral hues such as white or gray, Shaker cabinets are definitely popular these days. Not only do they look elegant with their simple, clean and functional design, but they are also easy to maintain as there are no nooks or crevasses to clean or where food splatters or grease may get stuck. A simple wipe with a microfiber cloth will be enough to take care of regular cleaning needs of these cabinets. Rustic cabinets have a lot of character and detail and show off the wood’s features but they may use brass or wrought-iron hardware which will require diligent cleaning. Traditional cabinet styles involve raised-panel doors or bead-board designs and these can require some maintenance as the nooks can collect dust and dirt. Contemporary kitchen cabinet styles feature flat surfaces and little ornamentation making their maintenance relatively easy. Slab or flat-panel cabinet styles lack nooks and crannies and are therefore easier to clean and generally low maintenance. Country cabinets have decorative features such as raised-panel and bead-board making them high on maintenance. Louvered kitchen cabinet doors are stylistic but not so easy to maintain. Upper kitchen cabinets with glass-front doors can be great to showcase your glassware, bowls or vases but they will require gentle care and cleaning. Here are a few more ways to make your kitchen cabinets low on maintenance. Fancy knobs, decorative legs, crown molding, and other such embellishments make for great looks but can be tough to clean and maintain. You can instead opt for other designer features which require less TLC — think of interesting cabinet paint options or eccentric LED lighting options. Between painted vs stained kitchen cabinets, it’s a choice based on many factors. Smooth painted surfaces will definitely highlight food stains and splatters making maintenance more cumbersome. Stained surfaces are also easier to touch-up. A touched-up painted cabinet is more easily ‘noticed’ since paint doesn’t take touch-ups as well as stains do. It’s also difficult to find paint that exactly matches the paint used by the cabinet manufacturer. Paint also ‘chips’ easily and this is something to think about particularly if your household has kids or if you are planning on kids. If you use oak or hickory, they have dark grains which hide scratches and stains better than wood species like maple. A stain with the grain is also easier to touch-up. Flush plywood ends for your cabinets make for smooth and sleek finishes and are easier to clean. Matching ends, on the other hand, have a panel with the same style as the door fronts. These will bring elegance but also maintenance issues like with raised-panel cabinet styles. Just like glass-front cabinet door styles, open shelving is great for displaying your collection of cookware and other items but they also require more time and effort to maintain. So, it’s not something if you would want to waste time doing if you are writing a novel in your free time apart from taking care of household duties as well as kids. If your cabinets go right up to the ceiling level, there won’t be any place for dirt on the tops of cabinets. Take a used dryer sheet and wipe your cabinets and trim with it for dust-free surfaces. You can protect your sink cabinet from moisture by ordering the cabinet to be made entirely with plywood. You can also use a cabinet mat and place it at the base of the sink cabinet. There you have it. These are some ideas to keep in mind and handy tricks to have up your sleeve for low maintenance kitchen cabinets.